How many people do we grant asylum or protection to? Back to Immigration Statistics January to March 2017 content page. Data relate to the year ending March 2017 and all comparisons are with the year ending March 2016, unless indicated otherwise. This section covers asylum applications, initial decisions, estimated final outcomes, resettlement, unaccompanied asylum-seeking children (UASC), international comparisons and support. In the year ending March 2017, there were 9,634 grants of asylum or an alternative form of protection to main applicants and their dependants, and an additional 6,245 people newly provided with protection and support under a resettlement scheme the UK. Asylum applications in the UK from main applicants decreased by 17% to 28,891 in the year ending March 2017. There were 3,680 asylum applications from UASC in the year ending March 2017, a 9% increase compared to the previous year (3,389). Overall, UASC applications represented 13% of all main applications for asylum. Of the 24,293 initial decisions on asylum applications from main applicants, 33% were grants of asylum or an alternative form of protection, compared to 40% in the previous year. A separate Home Office analysis shows that for the years 2012 to 2014, on average 36% of decisions were granted initially, but this proportion rose to 49% after appeal. There were 1,507 grants of asylum or an alternative form of protection to Syrian nationals at initial decision in the year ending March 2017 and an additional 5,453 Syrian nationals were granted humanitarian protection under the Syrian Vulnerable Persons Resettlement Scheme (VPRS). Since this scheme began in 2014, a total of 7,307 people have been resettled. 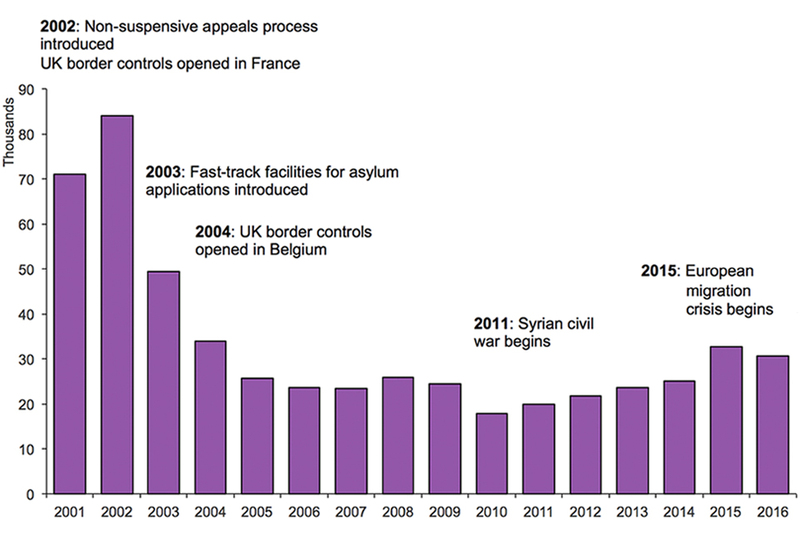 The chart below shows the annual number of asylum applications made since 2001. Source: Home Office, Immigration Statistics January to March 2017, Asylum table as 01 (Asylum volume 1). Three of the top 5 nationalities applying for asylum in the year ending March 2010 were still present in the top 5 in the year ending March 2017 (Afghanistan, Iran and Pakistan). Zimbabwe was ranked first for asylum applications in the year ending March 2010, but fell to 21st in the year ending March 2017. 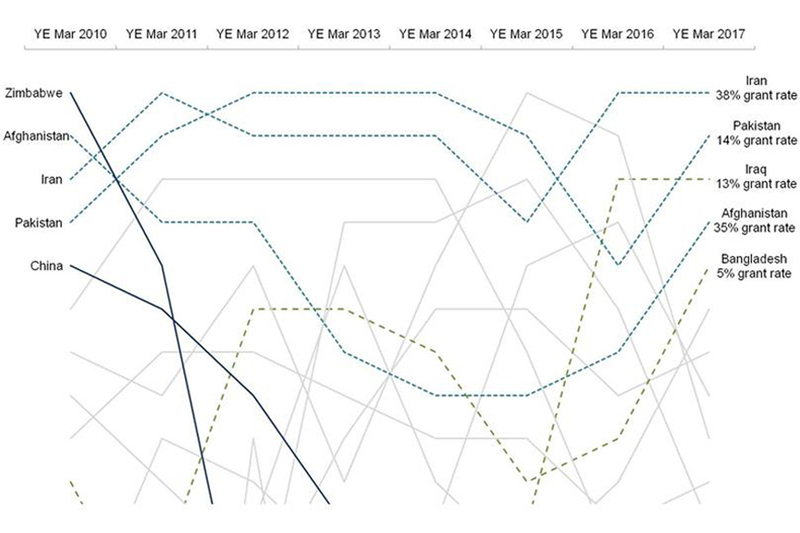 Iraq is now ranked third for asylum applications, up from the series low of 18th in the years ending March 2012 and 2013. A UASC is a person under 18, or in the absence of documentary evidence establishing age, appears to be under 18, who is applying for asylum in his or her own right and has no relative or guardian in the United Kingdom. Of the 1,747 initial decisions relating to UASC made in the year ending March 2017, 38% were grants of asylum or another form of protection, and 40% were grants of temporary leave (UASC leave). UASC applicants that are refused will include those from countries where it is safe to return children to their families, as well as some applicants who were determined to be over 18 following an age assessment. At the end of March 2017, a total of 39,365 people were receiving a cash allowance, somewhere to live, or both, in the UK (under Section 95 of the Immigration and Asylum Act 1999). This number has increased from 35,683 at the end of March 2016. The total figure remains considerably below that for the end of 2003 (the start of the published data series), when there were 80,123 people in receipt of Section 95 support. Separately, at the end of March 2017, there were 3,821 people receiving support under Section 4 of the Immigration and Asylum Act 1999. In addition to those asylum seekers who apply in the UK, resettlement schemes are offered to those who have been referred to the Home Office by The United Nations Refugee Agency (UNHCR). On 7 September 2015, an expansion to the existing Syrian VPRS was announced. Through this expansion, it was proposed that 20,000 Syrians in need of protection be resettled in the UK by 2020. A total of 7,307 people have been granted humanitarian protection under the Syrian VPRS since the scheme began, and in the year ending March 2017, 5,453 people were resettled under the Syrian VPRS across 235 different local authorities. Half (50%) of those resettled under the Syrian VPRS were under 18 years old (2,726), and around half (47%) were female (2,571). Figures in this section are based on data supplied by the individual countries to the Intergovernmental Consultations on Migration, Asylum and Refugees (IGC), UNHCR and Eurostat. Not all countries provide the latest data in time for each Immigration Statistics release. Where a figure is unavailable for a given month, we estimate it using the average of the last 3 months available, unless the time series is erratic, when we use the average of the last 12 months. Including dependants, the total number of asylum applications to the EU in the year ending March 2017 was an estimated 1,062,000, a decrease of 25% compared to the year ending March 2016 (1,410,000). Source: Eurostat Asylum quarterly report. (1) Figures are rounded to the nearest 1,000 and so may not sum to the total. (2) The estimated figures in this chart are based on data supplied to IGC and UNHCR.